If you’re a cyclist who loves going on long bike rides for recreation, exercise, or just to get where you need to go, you might very well be interested in a road bike. Road bikes are built for speed and distance, being appropriate for long rides due to their aerodynamic build and resistance to wind. There are a number of high quality road bikes at all prices, usually with the more expensive ones being of higher quality. That doesn’t, however, mean that there aren’t a great number of road bikes on the market for very affordable prices. There are quite a few high-quality, affordable road bikes on the market that can be found for less than $500.00. In our opinion, the Tommaso Imola Lightweight Aluminum Road Bike is the best road bike that can you can find for under $500.00. It combines very light weight with excellent gear shifting capabilities to create a bike that is both resistant to wind and great at climbing terrain of any steepness or consistency. First, let’s talk about the bike’s various features. It possesses a very lightweight aluminum frame that keeps friction and resistance off the ground, making the bike as fast as possible. It’s reinforced by an additional steel frame that is both resistant to wind and extremely durable. This will bike will last you a long time, regardless of how much wear and tear you put on it, and be very fast doing it. In total, the bike weighs around 35 pounds. The handlebars on the bike are curled under, allowing you to get your back lower, reducing wind resistance against your body, and increasing your speed overall. It allows for very narrow and compact wheels that reduce friction on the ground and also reduce overall wind resistance. You will have no trouble pedaling this bike long distances at high speeds. If you’re looking to buy a bike that can help you commute to work, this bike is very appropriate. The back of the bike has a triangle feature that allows you to attach baskets and racks with great security, making it easy for you to transport items from place to place. The bike, unfortunately, does not come equipped with pedals, meaning you’ll have to purchase and install your own. Now, let’s discuss the bike’s gear and chain system. It has a Shimano Claris triple crank set in the middle of the bike, trailed by a 12×25 cassette in the rear. Shimano makes very high-quality bike products, ensuring that the crank set is as good as you’re going to find. This provides the bike with a great deal of speeds, making it easy to climb steep hills, and also pedal comfortably on flat terrain. In total, the bike offers 24 speeds. This makes it a great bike for beginners who don’t have a great deal of experience in riding road bikes. You won’t have to do as much work as the bike will do a great deal of the work for you. The bike also makes use of Shimano Claris shifters, allowing for seamless and effortless gear shifting that can be done without using your hands. In addition, the bike makes use of Shimano Claris brakes; some of the premier bicycle brakes on the market that will ensure clean and safe stops every time you wish to slow down. Online reviewers love this bike for for how fast and comfortable it is, stating that it’s great for getting places quickly as well as going on group rides with friends and family. Reviewers also give the bike credit for its smooth ride, noting its lightweight and strong frame. Many online reviewers criticized the tires that the bike came equipped with, stating that they were uneven, wobbly, of defective. Many of these reviewers said that they purchased new wheels which made the bike run very smoothly and efficiently. Reviewers also note that the bike does not come with an instruction manual. This means that if you do not know how assemble a bike on your own, you must go to a bike shop so that someone can assemble it for you. 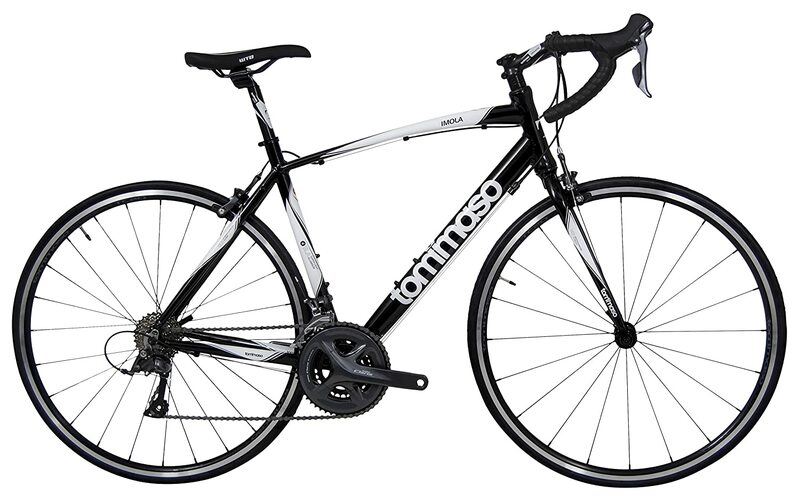 At $499.99 on most online retail sties, the Tommaso Imola Lightweight Aluminum Road Bike is the nicest road bike you’re going to find for under $500.00. Though its stock wheels are not of high quality, once you replace them you will have a great road bike that is both lightweight and tough. Its gear system and triple crank set are fantastic for beginners who still need a little help getting up steep hills successfully. If you’re looking for a quality road bike that will allow you to travel long distances at high speeds, the Tommaso Imola Lightweight Aluminum Road Bike might be the bike for you. Schwinn has always made high quality bikes of all varities; from mountain bikes and commuter bikes, to road bikes and race bikes. 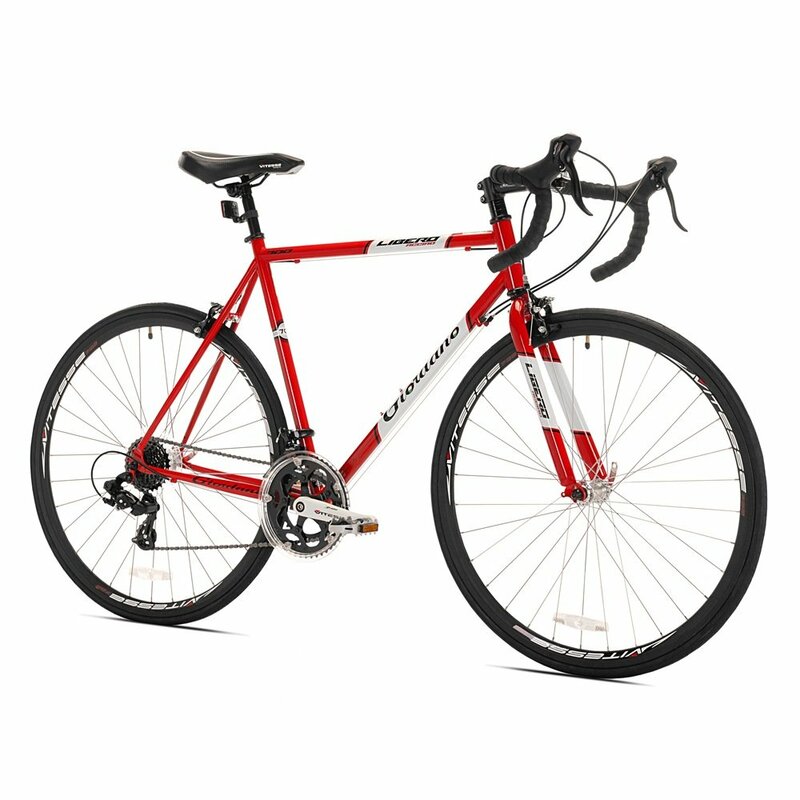 The nicest Schwinn road bike under $500.00 is, at the moment, the Schwinn Phocus 1600 Road Bike. It provides a lightweight and excellent gear shifting capabilities, letting you travel at high speeds with comfort and ease. The bike’s frame is made of aluminum, giving it a smooth and lightweight ride that reduces wheel to road friction, making it faster and easier to control overall. To provide the bike with additional smoothness and shock absorption, the bike’s fork is made of a carbon fiber material that both softens the blow of bumps and, and allows the wheel some give. Weighing in at 35 pounds, the bike is very lightweight, reducing friction on the road and allowing you to ride with great comfort. The bike’s handlebars are curled under, allowing you to get your back as low as possible, reducing wind resistance so that you and the bike can cut through it at high speeds. The frame of the bike also has a mount that allows you to attach a basket or water bottle holder, making it great for commuting to work or school. With 14 speeds, the bike does not contain as many speeds as some road bikes, making it appropriate for more experienced cyclists. This is because it will be more difficult for it to climb up steep hills. It contains a SR Suntour double crank set that allows for seamless shift transition in combination with Shimano Claris derailleurs and integrated shifters. This makes shifting as effortless as possible, creating a more comfortable and functional ride. Also involved in the gear system is an 8 speed cassette. In addition to this, the bike makes use of Promax alloy caliper road brakes which will allow you to brake in both timely and safe manner. Online reviewers give the bike applause for its high quality at an affordable price, with some reviewers saying its very similar to a bike that would cost $400 more than itdoes. They also enjoy the bike’s very light weight, saying that they feel as if they’re riding on the wind. One of the negative comments made about the bike is that it only comes in one size, suiting people between 5’8” and 6’0” in height the best. Reviewers also made critical comments about the bike’s seat, stating that it was very uncomfortable and that they were going to get a new one. Some users also complained about how narrow the handlebars were, though this has more to do with personal preference and size than anything else. At $400.00 on most online retail sites, you’re not going to find a road bike that’s too much better for its price. The Schwinn Phocus 1600 Road Bike combines light weight and a highly functional gear system to create a bike that is both fast and comfortable over long distances. You certainly won’t have any trouble riding it, whether its for recreational or serious purposes. If you want to buy a very good road bike at a very affordable price, you should definitely consider the Schwinn Phocus 1600 Road Bike. 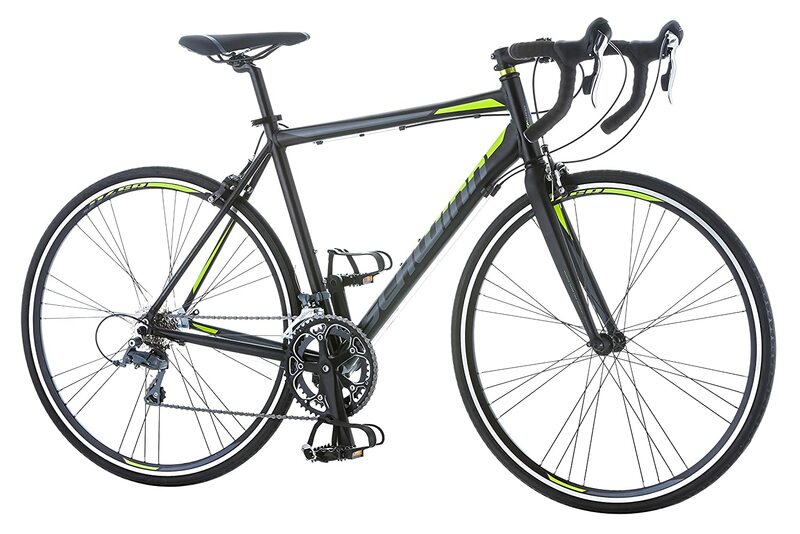 Another great road bike available for under $500.00 is the 2015 HASA R4 Road Bike Shimano 2400 24 Speed. It’s more lightweight than the previous two bikes on our list, giving it an even faster and smoother ride, and making it great for traveling long distances. As stated, the bike is very light, weighing in at around 21 pounds. This is extremely light for any type of bike; even a road bike. This will help to reduce friction on the ground, giving the bike a very smooth and fast ride. The bike’s frame is made of a very lightweight aluminum that is easy to both ride and carry for commuting purposes. To help cut down on wind resistance while riding, the bike has curled handle bars that allow you to bend lower, taking up less surface area, and making your ride faster overall. Unfortunately, if you do plan on using the bike to commute, it does not have a mount upon which you can attach a basket or rack. You will have to wear a book bag on your back in order to carry your things. Built with a Shimano 2400 triple crank set and an SRAM PG-850 8 speed cassette, this bike can be set at 24 different speeds. This makes it a great bike for beginner cyclists who might have trouble climbing steep hills. The bike can be set at a speed in which it will do a lot of the work for you as well as a speed in which you can do a lot of the work yourself. The gear shifts are easy to access, and easy to manipulate, making it simple and comfortable to change from speed to speed. As far as the bike’s breaking capabilities go, it is set up with Tektro alloy brake calibers, allowing for quick and safe braking at any speed you are traveling. Online reviewers laud this bike for how light it is, stating that it’s very easy to steer and control. Reviewers also note that the bike holds up very well over time, with one reviewer saying he has used it in 3 Iron Man competition with no problems. Many reviewers say that the assembly instructions that come with the bike are very hard to follow if you don’t have experience assembling a bike. Quite a few reviewers recommended taking the bike to a shop so that a professional can set it up. Reviewers also say that the seat is very hard and uncomfortable, and that it should be replaced if you plan on going long rides. All in all, the 2015 HASA R4 Road Bike Shimano 2400 24 Speed is very good bike for beginner road cyclist. At $499.99 on most online retail sites, it provides a light weight and smoothness that goes far beyond the value of its price tag. If you’re just getting into cycling, you should definitely consider this bike. With the ability to easily climb hills and glide over flat terrain, the 2015 HASA R4 Road Bike Shimano 2400 24 Speed is a great bike for under $500.00. Purchasing a road bike is a rather big investment. 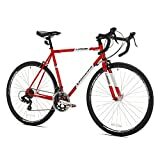 Even the cheapest road bikes are usually in the $400.00 or $500.00 range. 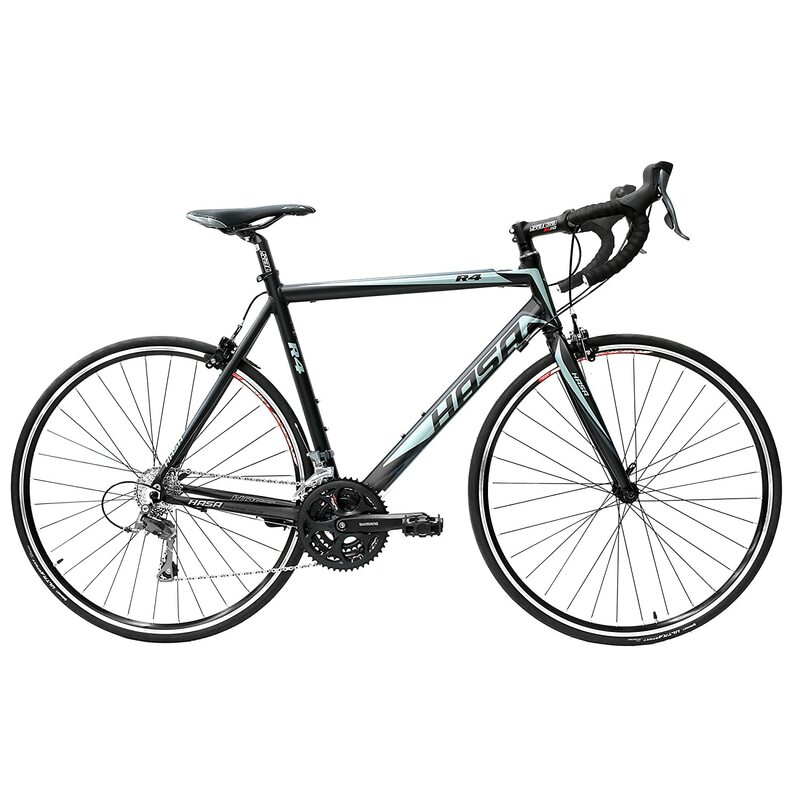 However, there are some high quality road bikes that can be found for a more affordable price. One such road bike is the Giordano Libero Acciao Road Bike. Weighing in at 36 pounds, the bike is comparable in weight to the first two bikes on the list. The difference is in the material that the bike’s frame is made of. Whereas the fist two bikes are made of aluminum and carbon fiber, the Libero Acciao’s frame is made completely of steel. This is going to take away some of the bikes smoothness and absorption, but it will also be more durable, causing it to last a longer period of time. With curled under handle bars, the bike allows the user to keep his or her back as low as possible, resulting in minimum wind resistance, and causing the bike to move faster. If you hope to commute with the bike, it does have a rack upon which you can attach a basket or water bottle. As far as gear and shift capabilities go, the bike has 14 speeds. This means that it has a double or compact crank set, making it more appropriate for more experienced riders who are good at climbing steep hills. The bike’s cassette is a 7 speed. Gear shifts on the bike are easily accessible by hand, and shift gears seamlessly. Online Reviewers have no complaints as far as the bike’s braking capabilities go. Online reviewers love how easy the bike is to handle, with many of them stating that it’s a great bike to use for commuting to school and work. Reviewers also laud the bike for how easy it is to assemble. One complaint about the bike is that that it comes with poor quality tires. Many users say that they replaced the tires almost as soon as the bike arrived. Some reviewers also found the seat to be uncomfortable, though some say that they grew used to it. For $350.00 on most online retail sites, the Giordano Libero Acciao Road Bike is a smooth-riding, easy-shifting, high-performing bike for a price that you won’t find anywhere else on a bike of its caliber. If you’re needing a bike to commute to work or school, or simply to ride for recreation, this bike will certainly get the job done. The Giordano Libero Acciao Road Bike a great purchase for anyone looking to break into cycling. There are a number of features to consider when perusing road bikes, with each feature contributing to the overall performance of the bike. Probably the most key feature of a road bike is light weight. By having a lightweight frame with lightweight wheels and other components, the bike is able to keep as much pressure off the ground as possible. This reduces friction, and in turn, makes the bicycle travel faster. Another important feature is the shape of the handle bar. Many road bikes have curled handle bars which allow the rider to bend his or her back further down, reducing wind resistance and increasing speed. Other road bikes have straight handle bars like mountain bikes do. These handle bars are acceptable, but will usually result in more wind resistance. The narrowness of the bike is very important, as the more narrow the bike is, the more it will cut through the wind and move faster. Look for a bike that has both a narrow frame and narrow wheels. Road bikes are also free of front and rear suspension. Suspension is needed in a mountain bike to absorb the shock of the many bumps you might run into, but in a road bike, it just slows you down. When choosing a quality road bike, you should be considering all of these different features, and acting accordingly. There are several different bike types. Mountain bikes, commuter bikes, race bikes, and road bikes to name a few. Mountain bikes are recreational bikes used to go for comfortable rides at low to medium speeds. They’re probably the most commonly bought type of bike, and are usually just used for fun and riding around with friends or family. Commuter bikes are used by people to get to work or school. They often have baskets or other devices attached to them in order to carry bags and other possessions. They travel at low to medium speeds as well. Road bikes and race bikes are very similar. Some people even use the words interchangeably. But, truthfully, there are difference between the two. Race bikes are built for endurance as well as short bursts of speed, whereas road bikes are built for endurance as well as high speeds over long distances. If you’re into bicycle racing, you’re going to want a race bike. If you like going on long, high-speed bike trips for exercise and recreation, you’re going to want a road bike. In general, road bikes can be found with two different types of gears: 9 speed gears, and 10 speed gears. Each of these 9 speeds is attached to a chain ring, which is essentially a cylinder around which the bike’s chain rotates, making it either easier or harder to petal the bike at different speeds. The set of chain rings put together is referred to as a crank set. Typically, a beginner cyclist should purchase a bike with 3 chain rings. If the bike is a 9 speed bike, it will possess 9 speeds on each chain ring, making 27 speeds in total. This is referred to as a triple crank set. Having a greater number of speeds helps for when you have to go up steep hills, as you won’t have pedal quite as hard as you would have to on a bike that has 20 speeds. Another type of crank sets includes a compact crank set, which has 2 chain rings. These are included on 10-speed bikes, resulting in 20 speeds overall. These types of crank sets are appropriate for recreational riders. The last type of crank set is the double crank set. It also has 2 chain rings, but these chain rings are larger than those on the compact crank set. This type of crank set is also included on a 10 speed bike, and is most appropriate for performance bikes. So, in general, if you’re a beginner cyclist, you should look for a bike with a triple crank set. The other crank sets are reserved more for experienced cyclists. Bike frames are made of aluminum or carbon fiber. Aluminum frames are typically less expensive than carbon fiber frames, and traditionally offer a fairly smooth ride. Most aluminum-framed bikes have a carbon-fiber front fork that absorbs some road shock, helping to keep the bike comfortable over long periods. Carbon fiber frames do a much better job of absorbing shock overall. They tend to be more comfortable than aluminum-framed bikes. The tradeoff, of course, is that they’re much more expensive. So, if you’re a casual rider who doesn’t plan on spending too long of a a time on your bike, you should probably go with an aluminum frame. You will save a lot of money, and will still have a quality bike that will suit you just fine for your needs. If you take your cycling seriously, you should probably consider a bike with a carbon fiber frame. It’s more comfortable and will better suit your long rides. Cycling is one of the most fun activities you can participate in. The idea of moving at high speeds simply through the power of your own legs is beyond invigorating. It can help to build confidence, and is sure to improve your physical health. 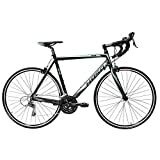 There are a number of quality road bikes for sale under $500.00 that can accommodate both casual and serious cyclists. When choosing a road bike, you should consider what type of cyclist you are, and what type of cyclist you plan to be in the future. If you just want a nice bike to take on casual rides, you can find many high-quality bikes for sale at decently low prices. If you want to ride hundreds of miles, you’ll probably have to pay a bit more. In either case, you should peruse all types of road bikes in order to get an idea of what type of bike is best for you.